Report all acts of domestic violence to the proper authorities. If you or someone you know is the victim of abuse, contact the police. Then seek the help of a battered men or women's organization. They are equipped to help you get back on your feet again during difficult times in your life. This is particularly difficult for codependents. Here's a codependency test, to see if this applies to you. Offer support to victims of violent acts. Having a tight-knit group of supporters can help abused men and women feel safe once again. Find ways to help out in your community whether it be donating your time to a domestic abuse hotline or by packing up care kits for the women's shelter. Speak out about spouse abuse by being an advocate. Volunteer your services wherever they are needed. Let people know that it is never okay to strike, kick, bite or shove their spouse. If you see someone acting irrationally and abusively, call the police. 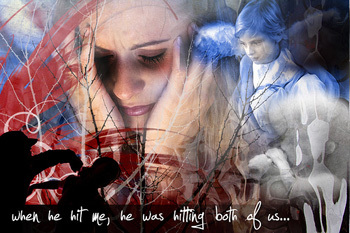 The victim may feel like he or she cannot do so because the abuser may retaliate. Educate the public about warning signs. Informing the public can be the key to ending domestic abuse once and for all. Wear buttons and t-shirts with positive messages on them. Host a workshop at your local recreational center. Hand out pamphlets to people on the street. Have a safety plan in place If you live with an individual with a short temper, know what options are available to you. Keep a small bag packed with your essentials so you can leave quickly. Have a friend or a family member's phone number close by in case you need to call them for help. Spouse abuse happens way too often in today's society. By speaking out against domestic violence, you have the ability to soften the blow of this growing phenomenon each and every day.